Aluminum City offer our Spring Valley, California, clients the highest-quality patio covers, awnings, door hoods, carports, and outdoor rooms at a cost-effective price. 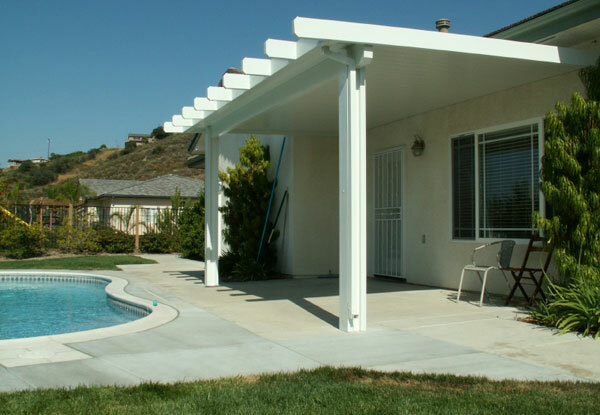 Established in 1963, we are a owner-operated and locally-owned patio cover company that has served thousands of homeowners and commercial businesses throughout Southern California. That we receive a third of our business through word-of-mouth referrals and returning clients is a testament to the durability, functionality, and beauty of our shade products. At Aluminum City, we sell and install patio covers, pergolas California rooms, and carports made by Four Seasons Building Products. These aluminum shade systems feature a wide range of customization options and are backed by a Lifetime Limited Warranty. All of their shade systems are installed by the owners themselves. Not only does this allow us to personally oversee each project, it allows us to offer pricing that is lower than 99% of our competitors. One of our owners personally meets with each prospective client when making sales, and work closely with our Spring Valley customers to ensure a personalized and collaborative experience. Our company specializes in designing, crafting, installing, and replacing all kinds of long-lasting and low-maintenance products. Not only do our patio covers and awnings provide protection and shade from the sun, they also add value to your Spring Valley property. Call us today for a free on-site estimate or consultation. We're open seven days a week, from 7 a.m. to 10 p.m., and our average project turnaround time is 2-3 weeks. With over thirty years of experience in the patio cover industry, we take great pride in our workmanship and project expertise. Aluminum City is licensed, bonded, and insured. At Aluminum City, we believe a superior quality patio cover begins with the building materials that it is made from. That's why we rely exclusively on the aluminum products from Four Seasons Building Products. They are the only manufacturer that first primes the surface of the aluminum prior to baking on the enamel paint. They also start with a thicker aluminum than any of its competitors. (If Spring Valley customers were to go elsewhere, they would need to upgrade their patio cover just to reach the same level of aluminum that we start at.) 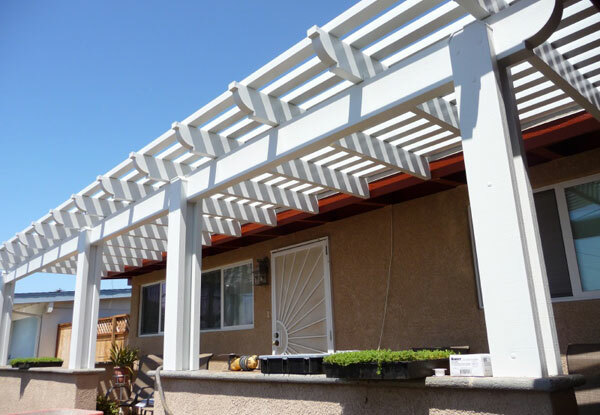 Our company relies on Four Seasons Building Products to build thousands of solid top, lattice/pergola top, and insulated top patio covers for residential and commercial clients throughout the San Diego region, including in Spring Valley. Four Seasons Building Products provides a Lifetime Limited Warranty on their building materials. 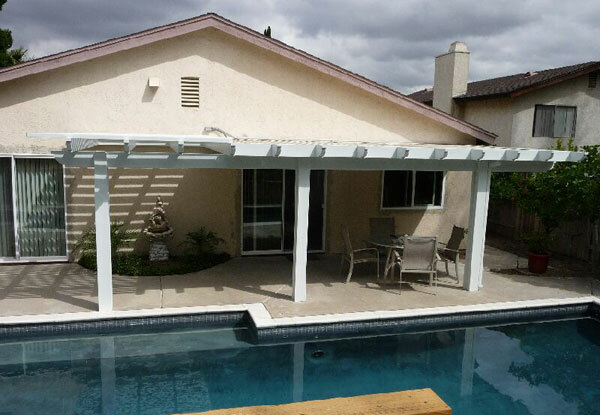 We build residential and commercial patio covers in a wide range of styles for our Spring Valley, California, customers. You can pick between a solid top, lattice/pergola top, or combination top, depending on your aesthetics and the amount of shade you prefer throughout the day. These patio cover options come in a smooth or wood grain finish, six different colors, a number of column styles (standard, round Roman, square Roman), and four different end cuts (scalloped cut, bevel cut, miter cut, corbel cut). While all of our patio cover tops dissipate heat, we also offer insulated patio covers to improve heat retention on cold days and reduce heat on warm days. All solid top patio covers come with built-in gutters and spouts for proper water drainage and control. For long-lasting, maintenance-free, and competitively priced patio covers, choose Aluminum City. Lattice patio covers or pergolas can be a beautiful addition to any Spring Valley property. Aluminum City designs, builds, and installs patio covers for residential and commercial structures, and can create patio covers with roof tops that are entirely lattice or a combination of lattice and solid top. They can be built in various styles for a personalized look. You get to pick a preferred finish, cut, column thickness, and color for your pergola/lattice patio cover, which can be matched to fit the outdoor decor of your Spring Valley business or home. Our pergola patio covers provide cool shade and protection from the sun. They are also lightweight and virtually maintenance-free, ensuring decades of easy enjoyment. At Aluminum City, our Spring Valley clients have the choice to attach an insulated patio room enclosure, also known as a California Room, to their home or business. These rooms feature walls and roofs that are 3 to 4 inches thick and filled with polystyrene foam for energy efficiency. They come with dual-paned windows and can be installed with your choice of door (regular, sliding glass, or French). We can install ceiling fans and lights inside your insulated patio cover, and have a licensed and bonded electrician who performs all of our electrical work. Our insulated solid-top patio covers and room enclosures are all built with gutters and spouts to divert rainwater. Aluminum City always complies with Spring Valley city code, and will acquire needed building permits, when necessary. 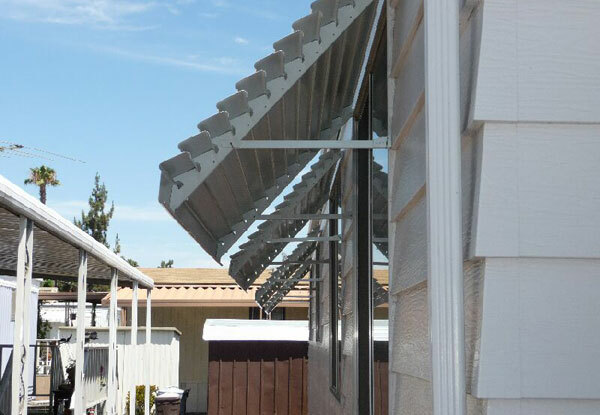 Aluminum City has built all kinds of canopies for residential and commercial clients throughout San Diego, including in Spring Valley, California. Our car canopies, or carports, can be freestanding or attached, built to nearly any size, and be customized to suit each customer's preferences. When building a carport, our process is to first visit your Spring Valley site to look over the property and determine what kind of structure would best meet your needs. 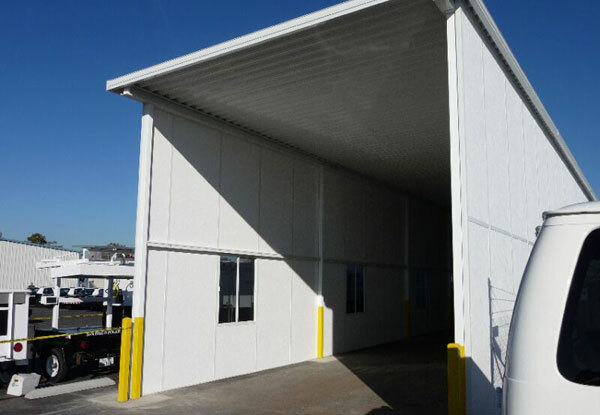 We typically build our carports with a solid top, which helps to protect automobiles, machinery, equipment, and other property from the elements and the sun. At Aluminum City, all of our Spring Valley carports are built to code and are exceptionally cost effective. Our company has built functional window awnings and door hoods in San Diego for decades. Our clientele has included police departments, office buildings, retirement homes, Navy bases, border patrol, single-family homes, and restaurants. Cost-effective and low-maintenance, aluminum window awnings and door hoods are a practical alternative to iron or fabric awnings. They are fabricated and built to last for at least forty years with little to no maintenance. Constructed of solid aluminum panels slatted at a 45-degree angle, they are available in twenty different colors. The materials are all custom-made to perfectly fit and complement your residential or commercial property in Spring Valley, California. Beautiful! Patio cover turned out better than our expectations. Excellent workmanship, Professional Great to work with. They were very accommodating with our older home with smaller patio. 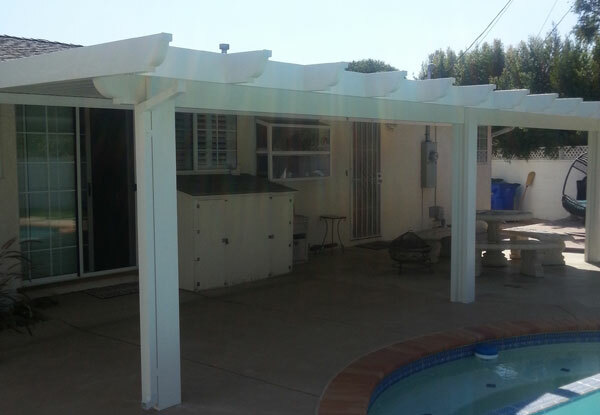 We installed this attached patio cover in Spring Valley, CA. The patio cover is a solid 6" C-E flatpan (solid top) classic aluminum and features an embossed wood grain finish.